Contact is a 1997 American science fiction drama film directed by Robert Zemeckis. It is a film adaptation of Carl Sagan's 1985 novel of the same name; Sagan and his wife Ann Druyan wrote the story outline for the film. Jodie Foster portrays the film's protagonist, Dr. Eleanor "Ellie" Arroway, a SETI scientist who finds strong evidence of extraterrestrial life and is chosen to make first contact. The film also stars Matthew McConaughey, James Woods, Tom Skerritt, William Fichtner, John Hurt, Angela Bassett, Rob Lowe, Jake Busey and David Morse. Carl Sagan and Ann Druyan began working on the film in 1979. Together, they wrote a 100+ page film treatment and set up Contact at Warner Bros. with Peter Guber and Lynda Obst as producers. When development stalled on the film, Sagan published Contact as a novel in 1985 and the film adaptation was rejuvenated in 1989. Roland Joffé and George Miller had planned to direct it, but Joffé dropped out in 1993 and Warner Bros. fired Miller in 1995. Robert Zemeckis was eventually hired to direct, and filming for Contact lasted from September 1996 to February 1997. Sony Pictures Imageworks handled most of the visual effects sequences. The film was released on July 11, 1997. Contact grossed approximately $171 million in worldwide box office totals. The film won the Hugo Award for Best Dramatic Presentation and received multiple awards and nominations at the Saturn Awards. Dr. Ellie Arroway works for the SETI program at the Arecibo Observatory in Puerto Rico. Guided into science and communication by her now-deceased father, she listens to radio emissions from space, hoping to find evidence of alien life. David Drumlin, the president's science advisor, pulls the funding from SETI, because he believes that the endeavor is futile. 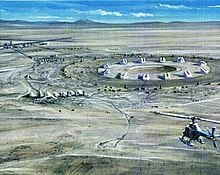 Arroway gains backing from secretive billionaire industrialist S. R. Hadden's company, which allows her to continue the project at the Very Large Array (VLA) in New Mexico. Four years later, with Drumlin seeking to close SETI, Arroway discovers a signal repeating a sequence of prime numbers, apparently sent from the star system Vega some 26 light-years away. This announcement causes Drumlin and the National Security Council led by Michael Kitz to attempt to take control of the facility. Arroway's team discovers a video hidden in the signal: Adolf Hitler's opening address at the 1936 Summer Olympics in Berlin, Germany. Arroway and her team postulate that this would have been the first television signal strong enough to leave Earth's ionosphere, reach Vega, and be transmitted back. The project is put under tight security and its progress followed worldwide. Arroway finds the signal also contains more than 63,000 pages of indecipherable data. The reclusive S. R. Hadden secretly meets with Arroway to provide the means to decode the pages. The pages reveal schematics for a complex machine that is determined to be some kind of transport for a single occupant. The nations of the world fund the construction of the machine at Cape Canaveral. An international panel is assembled to choose a candidate to travel in the machine. Although Arroway is a frontrunner to go, her hopes are scuppered by Christian philosopher Palmer Joss, a panel member whom Arroway met and briefly became romantically involved with in Puerto Rico. When he brings attention to her atheism, the panel selects Drumlin, as more representative of humanity. When the machine is tested, a religious terrorist destroys the machine in a suicide bombing, killing Drumlin and several others. A cancer-stricken Hadden, now in residence on the Mir space station, reveals to Arroway that his company had secretly made a second machine in Japan and that Arroway will be the one to go. Outfitted with several recording devices, Arroway enters the machine's pod, which is then dropped into four rapidly spinning rings, causing the pod to apparently travel through a series of wormholes. Arroway sees a radio array-like structure at Vega and signs of an advanced civilization on another planet. She then finds herself on a beach, similar to a childhood picture she drew of Pensacola, Florida, and a figure approaches that becomes her deceased father. Arroway recognizes him as an alien taking her father's form and attempts to ask questions. The alien tells her that the familiar landscape and form were used to make their first contact easier for her and that this journey was just humanity's first step to joining other spacefaring species. Arroway falls unconscious as she begins traveling back through a wormhole. She awakens to find herself on the floor of the pod, the mission control team repeatedly hailing her. She learns that, from outside the machine, it appears the pod merely dropped through the machine's rings and landed in a safety net. Arroway insists that she was gone for approximately eighteen hours, but her recording devices show only static. A Congressional Committee is formed and speculates that the signal and machine were a hoax designed by the now-deceased Hadden. Arroway asks the committee to accept the truth of her testimony on faith. In an online private conversation, Kitz and White House official Rachel Constantine reflect on confidential information that, although Arroway's recording device only recorded static, it recorded eighteen hours of it. Arroway and Joss reunite and Arroway receives ongoing financial support at the VLA. They added the science and religion analogies as a metaphor of philosophical and intellectual interest in searching for the truth of both humanity and alien contact. Sagan and Druyan disagreed with Guber's idea and it was not incorporated into the storyline. In 1982, Guber took Contact to Warner Bros. Pictures and with the film's development stalled, Sagan started to turn his original idea into a novel, which was published by Simon and Schuster in September 1985. The film adaptation remained in development and Guber eventually vacated his position at Warner Bros. in 1989. In December 1993, Warner Bros. hired George Miller to direct and Contact commenced pre-production. Miller cast Jodie Foster in the lead role, approached Ralph Fiennes to play Palmer Joss and also considered casting Linda Hunt as the President of the United States. In addition to having aliens put on a laser lighting display around Earth, another version of the Goldenberg scripts had an alien wormhole swallow up the planet, transporting Earth to the center of the galaxy. Miller also asked Goldenberg to rewrite Contact in an attempt to portray the Pope as a key supporting character. Warner Bros. was hoping to have the film ready for release by Christmas 1996, but under Miller's direction pre-production lasted longer than expected. The studio fired the director, blaming pushed-back start dates, budget concerns, and Miller's insistence that the script needed five more weeks of rewriting. Robert Zemeckis, who previously turned down the director's position, decided to accept the offer. Warner Bros. granted Zemeckis total artistic control and the right of final cut privilege. The director cast Matthew McConaughey as Palmer Joss; McConaughey dropped out of the lead role in The Jackal to take the role in Contact. Despite being diagnosed with myelodysplasia in 1994, Sagan continued to be involved in the production of the film. For the cast and main crew members, he conducted an academic conference that depicted a detailed history of astronomy. During the development of Contact, the production crew watched Stanley Kubrick's 2001: A Space Odyssey (1968) for inspiration. Principal photography began on September 24, 1996, and ended on February 28, 1997. The first shooting took place at the Very Large Array (VLA) near Socorro, New Mexico. "Shooting at the VLA was, of course, spectacular but also one of the most difficult aspects of our filming," producer Steve Starkey said. "It is a working facility, so in order for us to accomplish shots for the movie, we had to negotiate with the National Science Foundation for 'dish control' in order to move the dishes in the direction we needed to effect the most dramatic shot for the story." After arduous first weeks of location shooting in New Mexico and Arizona, production for Contact returned to Los Angeles for five months' worth of location and sound stage shooting that used a total of nine soundstages at Warner Bros. Studios in Burbank, and Culver Studios. All together, the art department created more than 25 sets. In an attempt to create a sense of realism for the storyline, principal CNN news outlet commentators were scripted into Contact. More than 25 news reporters from CNN had roles in the film and the CNN programs Larry King Live and Crossfire were also included. Ann Druyan makes a cameo appearance as herself, debating with Rob Lowe's character, Richard Rank, on Crossfire. In January 1997, a second unit was sent to Puerto Rico for one week at the Arecibo Observatory. Other second unit work took place in Fiji and Newfoundland, Canada. Also essential to the production were a host of technical consultants from the SETI Institute, the California Institute of Technology, the VLA and a former White House staff member to consult on Washington D.C. and government protocol issues. Sagan visited the set a number of times, where he also helped with last-minute rewrites. Filming was briefly delayed with the news of his death on December 20, 1996. Contact was dedicated to Sagan: "For Carl" comes on the screen at the fade. Cinematographer Don Burgess shot the film in anamorphic format using Panavision cameras as well as using large format 65mm and VistaVision for special effects shots. The sound designers used Pro Tools software for the audio mixing, which was done at Skywalker Sound. Designing Contact's visual effects sequences was a joint effort among eight separate VFX companies. This team included Sony Pictures Imageworks, Peter Jackson's Weta Digital, George Lucas' Industrial Light & Magic, and Effects Associates, with Pixar's RenderMan used for CGI rendering. Weta Digital, in particular, was responsible for designing the wormhole sequence. Jodie Foster admitted she had difficulty with blue screen technology because it was a first for the actress. "It was a blue room. Blue walls, blue roof. It was just blue, blue, blue," Foster explained. "And I was rotated on a Lazy Susan with the camera moving on a computerized arm. It was really tough." News footage of then-President Bill Clinton was digitally altered to make it appear as if he is speaking about alien contact. This was not the original plan for the film; Zemeckis had initially approached Sidney Poitier to play the president, but the actor turned the role down in favor of The Jackal. Shortly after Poitier's refusal, Zemeckis saw a NASA announcement in August 1996. "Clinton gave his Mars rock speech," the director explained, "and I swear to God it was like it was scripted for this movie. When he said the line 'We will continue to listen closely to what it has to say,' I almost died. I stood there with my mouth hanging open." One notable feature of Contact is its use of digital color correction. This approach helped solve continuity errors during the location shooting at the Very Large Array in New Mexico. "The weather killed us, so we were going back in and changing it enough so that the skies and colors and times of day all seem roughly the same," visual effects supervisor Ken Ralston commented. The opening scene is a three-minute computer-generated sequence, beginning with a view of Earth from high in the exosphere and listening in on numerous radio waves of modern programming emitting from the planet. The camera then starts zooming backward, passing the Moon, Mars, and other features of the solar system, then to the Oort cloud, interstellar space, the Local Bubble, the Milky Way, other galaxies of the Local Group, and eventually into deep space. As this occurs, the radio signals start to drop out and reflect older programming, representing the distance these signals would have traveled at the speed of light, eventually becoming silent as the distance becomes much greater. The sequence eventually resolves into the iris of young Ellie's eye as she is listening on her amateur radio. This scale view shot of the entire universe was inspired by the short documentary film Powers of Ten (1977). At the time, it was the longest continuous computer-generated effect for a live-action film, eventually surpassed by the opening sequence from The Day After Tomorrow (2004). One sequence, with young Ellie running upstairs to try to retrieve her father's medicine, appears to have Ellie running just behind a camera as they move into the bathroom, but the shot resolves to show that this had been part of the medicine cabinet's mirror reflection, pulling back to have Ellie open it. This sequence is noted as one of the film's most impressive visual effects due to the seamlessness of the transition. According to Carin-Anne Strohmaier, the first assistant film editor, the shot was created through three different plates, digitally manipulated in CGI to create the effect: one plate was from the cameraman leading Ellie, the second of Ellie opening the cabinet door (which was a blue screen instead of a mirror), and the third of the reflection of Ellie and her dad when the door closes. Initially, they had planned to use an effect similar to bullet time from The Matrix to show Ellie's father stopped in time as he dies, but as the movie was being filmed, they found that this approach would not fit the casting or direction the film was going, but they still wanted something that the audience would recognize as off-putting and without having to show Ellie's dad, leading to the development of this mirror sequence. The decoding of the extraterrestrial message, with its architectural drawings of the machine, was created by Ken Ralston and Sony Pictures Imageworks. This is the sixth film collaboration between director Zemeckis and VFX supervisor Ralston. Imageworks created more than 350 visual effects shots, using a combination of model and miniature shots and digital computer work. On designing the Machine, Zemeckis explained that "The Machine in Sagan's novel was somewhat vague, which is fine for a book. In a movie, though, if you're going to build a giant physical structure of alien design, you have to make it believable." He continued that "it had to be huge, so that the audience would feel like it was bigger than man should be tinkering with. It had to look absolutely real." The machine was then designed by concept artist Steve Burg, reusing a conceptual design he had originally created to appear as the "Time Displacement Device" in Terminator 2 in a scene that did not make the final cut. Early conceptual designs of the Pod itself were based, as it existed in the novel, on one of the primary shapes in geometry, a dodecahedron, or a twelve-sided figure. Eventually the Pod was modified to a spherical capsule that encases the traveler. Zemeckis and the production crew also made several visits to the Kennedy Space Center at Merritt Island adjacent to Cape Canaveral, where officials allowed them access to sites off-limits to most visitors. Filmmakers were also brought onto Launch Complex 39 before the launch of the space shuttle. There, they concentrated on the mechanics of the elevator and the gantry area and loading arm. The resulting photographs and research were incorporated into the design of the machine's surrounding supports and gantry. Once the concept met with the filmmakers' approval, physical construction began on the sets for the Pod itself, the interior of the elevator, and the gantry, which took almost four months to build. The rest of the effects were compiled digitally by Imageworks. The climactic scene depicting the mysterious beach near the galactic core where Arroway makes contact, in particular, called for major visual innovations. The goal was an idyllic seashore with a sky blazing with stars that might exist near the core of the galaxy. Ralston said that "the thought was that this beach would have a heightened reality. One that might make the everyday world seem like a vague daydream." To keep the question alive whether any of it was real in Arroway's mind, elements such as ocean waves running in reverse and palm tree shadows swaying with sped-up motion were applied. The Hitler newsreel also required digital manipulation. The original score was composed by Alan Silvestri, most of which was released on August 19, 1997, by Warner Bros. Records. The full score is approximately an hour long, 44 minutes of which is on the CD, including every major cue. The CD track entitled "Good to Go" features a slightly different opening—a brief brass motif that is not in the film—but all other cues are identical in orchestration to the mix in the film. The Region 2 Special Edition DVD release contains a 5.1 isolated score track, which presents the complete score (this feature, as with many isolated scores, is not mentioned in most product descriptions of the DVD). 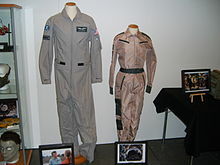 Contact often suggests that cultural conflicts between religion and science would be brought to the fore by the apparent contact with aliens that occurs in the film. A point of discussion is the existence of God, with several different positions being portrayed. A description of an emotionally intense experience by Palmer Joss, which he describes as seeing God, is met by Arroway's suggestion that "some part of [him] needed to have it"—that it was a significant personal experience but indicative of nothing greater. Joss compares his certainty that God exists to Arroway's certainty that she loved her deceased father, despite her being unable to prove it. Contact depicts intense debate occurring as a result of the apparent contact with aliens. Many clips of well-known debate shows such as Crossfire and Larry King Live are shown, with participants discussing the implications of the message, asking whether it is proof of the existence of alien life or of God, and whether science is encroaching upon religious ground by, as one believer puts it, "talking to your god for you." The head of a religious organization casts doubt on the morality of building the machine, noting: "We don't even know whether [the aliens] believe in God." The first machine is ultimately destroyed by a religious extremist, in the belief that building it was detrimental to humankind. Although the revelation at the end of the film that Arroway's recording device recorded approximately 18 hours of static is arguably conclusive proof of the fact of—if not the experience of—her "journey", several coincidences and indications throughout the film cast doubt on its authenticity. Director Robert Zemeckis indicated: "The point of the movie is for there always to be a certain amount of doubt [as to whether the aliens were real]." These indications consist mostly of visual cues during the "journey" that echo Ellie's experiences earlier in the film (which Ellie believed to be the result of the aliens "downloading [her] thoughts and memories"), but the timing of the message's arrival and its eventual decoding are also highly coincidental: the message was first received shortly before Arroway and her team were to be ejected from the VLA facility and was successfully decoded only by S.R. Hadden (Arroway's only sponsor, who was close to death from cancer) after weeks of failed attempts by the team at the VLA. At the end of the film, Arroway is put into a position that she had traditionally viewed with skepticism and contempt: that of believing something with complete certainty, despite being unable to prove it in the face of not only widespread incredulity and skepticism (which she admits that as a scientist she would normally share) but also evidence apparently to the contrary. Zemeckis stated that he intended the message of the film to be that science and religion can coexist rather than being opposing camps, as shown by the coupling of scientist Arroway with the religious Joss, as well as his acceptance that the "journey" indeed took place. This, and scattered references throughout the film, posit that science and religion are not nominally incompatible: one interviewer, after asking Arroway whether the construction of the machine—despite not knowing what will happen when it is activated—is too dangerous, suggests that it is being built on the "faith" that the alien designers, as Arroway puts it, "know what they're doing." Contact's release in July 1997 rekindled public interest in Sagan's 1985 novel. The book remained on The New York Times Best Seller list from July 27 to September 21, 1997. Contact premiered on July 1, 1997, at the Westwood Theater in Los Angeles, California. The film was released in the United States on July 11, 1997, in 1,923 theaters, earning $20,584,908 in its opening weekend. Contact eventually grossed $100,920,329 in the US and $70,200,000 in foreign countries, reaching a worldwide total of $171,120,329. On the basis of 63 reviews collected by Rotten Tomatoes, 62% of critics gave positive reviews, with an average score of 6.8/10. Metacritic calculated an average score of 62 out of 100, based on 23 reviews, denoting "generally favorable reviews". 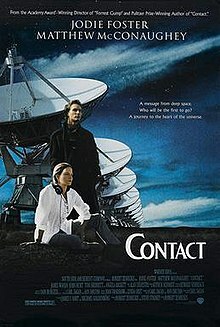 Roger Ebert said Contact was on par with Steven Spielberg's Close Encounters of the Third Kind (1977) as Hollywood's most cinematic study of extraterrestrial life. "Movies like Contact help explain why movies like Independence Day leave me feeling empty and unsatisfied," Ebert commented. On December 21, 2011, Ebert added Contact to his "Great Movies" collection. Kenneth Turan of the Los Angeles Times said the film carried a more philosophical portrait of the science fiction genre than did other films, but still managed "to satisfy the cravings of the general public who simply want to be entertained". Internet reviewer James Berardinelli said Contact is "one of 1997's finest motion pictures, and is a forceful reminder that Hollywood is still capable of making magic." Berardinelli felt the film was on par with Stanley Kubrick's 2001: A Space Odyssey (1968) to be one of the greatest science fiction films ever made. Mick LaSalle of the San Francisco Chronicle largely enjoyed the first 90 minutes of Contact but felt that director Robert Zemeckis was too obsessed with visual effects rather than cohesive storytelling for the pivotal climax. Rita Kempley, writing in The Washington Post, did not like the film's main premise, which she described as "a preachy debate between sanctity and science." Good afternoon. I'm glad to be joined by my science and technology adviser ...[words cut by film editors]... This is the product of years of exploration ...[words cut]... by some of the world's most distinguished scientists. Like all discoveries, this one will and should continue to be reviewed, examined, and scrutinized. It must be confirmed by other scientists. But clearly, the fact that something of this magnitude is being explored is another vindication ...[film scene performed over recording, with dialogue obscuring Clinton's remarks and creating a gap]... If this discovery is confirmed, it will surely be one of the most stunning insights into our universe that science has ever uncovered. Its implications are as far reaching and awe inspiring as can be imagined. Even as it promises answers to some of our oldest questions, it poses still others even more fundamental. We will continue to listen closely to what it has to say as we continue the search for answers and for knowledge that is as old as humanity itself but essential to our people's future. Thank you. I would encourage you not to inflame this situation beyond the facts. Let us deal with this on the facts. We are monitoring what has actually happened. On July 14, 1997, three days after the film opened in the United States, Warner Bros. received a letter from White House Counsel Charles Ruff protesting against the use of Clinton's digitally-composited appearance. The letter made no demands, but called the duration and manner of Clinton's appearance "inappropriate". No legal action was planned; the White House Counsel simply wanted to send a message to Hollywood to avoid unauthorized uses of the President's image. Zemeckis was reminded that official White House policy "prohibits the use of the President in any way ... (that) implies a direct ... connection between the President and a commercial product or service." A Warner Bros. spokeswoman explained that "we feel we have been completely frank and upfront with the White House on this issue. They saw scripts, they were notified when the film was completed, they were sent a print well in advance of the film's July 11 opening, and we have confirmation that a print was received there July 2." However, Warner Bros. did concede that they never pursued or received formal release from the White House for the use of Clinton's image. While the Counsel commented that parody and satire are protected under the First Amendment, press secretary Mike McCurry believed that "there is a difference when the President's image, which is his alone to control, is used in a way that would lead the viewer to believe he has said something he really didn't say." Shortly after the White House's complaint, CNN chairman, president, and CEO Tom Johnson announced he believed that in hindsight it was a mistake to allow 13 members of CNN's on-air staff (including Larry King and Bernard Shaw) to appear in the film, even though both CNN and Warner Bros. are owned by Time Warner. Johnson added that, for Contact, the CNN presence "creates the impression that we're manipulated by Time Warner, and it blurs the line." CNN then changed their policies for future films, which now requires potential appearances to be cleared through their ethics group. Director George Miller, who had developed Contact with Warner Bros. before Zemeckis' hiring, unsuccessfully sued the studio over breach of contract policies. During filming on December 28, 1996, filmmaker Francis Ford Coppola filed a lawsuit against Warner Bros. and Sagan, who had died the previous week. Coppola claimed that Sagan's novel was based on a story the pair had developed for a television special back in 1975, titled First Contact. Under their development agreement, Coppola and Sagan were to split proceeds from the project, as well as from any novel Sagan would write, with American Zoetrope and Children's Television Workshop Productions. The TV program was never produced, but in 1985, Simon and Schuster published Contact and Warner moved forward with development of a film adaptation. Coppola sought at least $250,000 in compensatory damages and an injunction against production or distribution of the film. In February 1998, Los Angeles Superior Court Judge Ricardo Torres dismissed Coppola's claim. Although Torres agreed that Sagan violated some terms of the contract, he explained that Coppola waited too long to file his lawsuit, and that the contract might not be enforceable as it was written. Coppola then appealed his suit, taking it to the California Courts of Appeal (CCA). In April 2000, the CCA dismissed his suit, finding that Coppola's claims were barred because they were brought too late. The court noted that it was not until 1994 that the filmmaker thought about suing over Contact. The scene where the NASA scientists give Arroway the "cyanide pill" caused some controversy during production and when the film came out. Gerald D. Griffin, the film's NASA advisor, insisted that NASA has never given any astronaut a cyanide pill "just in case," and that if an astronaut truly wished to commit suicide in space, all he or she would have to do is cut off their oxygen supply. However, Carl Sagan insisted that NASA did indeed give out cyanide pills and they did it for every mission an astronaut has ever flown. Zemeckis said that because of the two radically different assertions, the truth is unknown, but he left the suicide pill scene in the movie as it seemed more suspenseful that way and it was also in line with Sagan's beliefs and vision of the film. Along with being NASA Technical Consultant for the project, Griffin had a cameo in the role of "Dynamics" in Mission Control. He had previously been technical advisor for Ron Howard's 1995 film Apollo 13. While working for NASA during the Apollo Program, he had been the actual flight director for that mission, among others, and during the 1980s was the director of the Johnson Space Center. ^ "CONTACT (PG)". British Board of Film Classification. July 22, 1997. Retrieved November 16, 2014. ^ a b c d e f g h i j k l m n o p q Benjamin Svetkey (July 18, 1997). "Making Contact". Entertainment Weekly. Retrieved January 27, 2009. ^ Carl Sagan (October 1985). Contact: A Novel. New York City: Simon and Schuster. p. 432. ISBN 0-671-43400-4. ^ "About the production". Warner Bros. Archived from the original on May 17, 2001. Retrieved January 30, 2009. ^ a b c d e f "Contact – High Technology Lends a Hand/Science of the Soundstage". Warner Bros. Archived from the original on March 4, 2001. Retrieved January 30, 2009. ^ William J. Broad (September 29, 1998). "Astronomers Revive Scan of the Heavens for Signs of Life". The New York Times. ^ a b c d e f g h i Norman Kagan (2003). "Contact". The Cinema of Robert Zemeckis. Lanham, Maryland: Taylor Trade Publishing. pp. 159–181. ISBN 0-87833-293-6. ^ a b c d John Evan Frook (December 16, 1993). "WB makes 'Contact'". Variety. Retrieved January 26, 2009. ^ Bernard Weinraub (July 6, 1997). "Using a Big Budget To Ask Big Questions". The New York Times. ^ Michael Fleming (July 10, 1997). "Verhoeven eyes 'Houdini'". Variety. Retrieved January 26, 2009. ^ Michael Fleming (December 16, 1996). "McConaughey inks with WB". Variety. Retrieved January 26, 2009. ^ "Creating Strange New Worlds". Warner Bros. Retrieved April 18, 2015. ^ Richard Buskin. "Making Contact". FilmSound.org. Retrieved January 30, 2009. ^ Ian Pryor (2003). Peter Jackson: From Prince of Splatter to Lord of the Rings. New York City: Thomas Dunne Books. p. 206. ISBN 0-312-32294-1. ^ Army Archerd (August 16, 1996). "Two 'Titanics' on collision course". Variety. Retrieved January 26, 2009. ^ Michael Mallory (May 8, 1997). "Invisible tricks of the trade". Variety. Retrieved January 28, 2009. ^ Tim Dirks. "Milestones in Film History: Greatest Visual and Special Effects and Computer-Generated Imagery (CGI) - Part 16". Filmsite.org. Retrieved January 29, 2009. ^ Anderton, Ethan (January 17, 2017). "You Probably Didn't Notice This Shot in 'Contact' Was Done with Visual Effects". /Film. Retrieved January 9, 2018. ^ Failes, Ian (July 10, 2017). "The famous mirror shot in 'Contact' was almost something else entirely". VGX Blog. Retrieved January 9, 2018. ^ "Steve Burg homepage". Steve Burg. Archived from the original on December 15, 2009. Retrieved September 9, 2009. ^ "Alan Silvestri, Alan Silvestri - Contact: Music From The Motion Picture - Amazon.com Music". amazon.com. ^ "Contact (Special Edition)  [DVD]". amazon.co.uk. ^ "Rakuten.co.uk Shopping: DVD - DVD & Blu-ray". play.com. Archived from the original on July 26, 2010. ^ "Paperback Best Seller: July 27, 1997". The New York Times. July 27, 1997. Retrieved January 28, 2009. ^ "Paperback Best Sellers: September 21, 1997". The New York Times. September 21, 1997. Retrieved January 28, 2009. ^ Anita M. Busch (July 3, 1997). "'Contact's' starry night". Variety. Retrieved January 26, 2009. ^ "Contact". Box Office Mojo. Retrieved January 27, 2009. ^ "Contact (1997)". Amazon.com. Retrieved January 27, 2009. ^ Casey Broadwater. "Contact Blu-ray". Blu-ray.com. ^ "Contact (1997)". Rotten Tomatoes. Fandango Media. Retrieved July 18, 2018. ^ "Contact Reviews". Metacritic. CBS Interactive. Retrieved February 27, 2018. ^ Roger Ebert (July 11, 1997). "Contact". Chicago Sun-Times. Retrieved January 27, 2009. ^ "Contact (1997)". Chicago Sun-Times. ^ Kenneth Turan (July 11, 1997). "Foster Passes Hearing Test". Los Angeles Times. Archived from the original on November 20, 2007. Retrieved January 27, 2009. ^ James Berardinelli. "Contact". ReelViews.net. Retrieved January 27, 2009. ^ Mick LaSalle (July 11, 1997). "Anybody There?". San Francisco Chronicle. Retrieved January 27, 2009. ^ Rita Kempley (July 11, 1997). "Contact". The Washington Post. Retrieved January 27, 2009. ^ Crenson, Matt (August 6, 2006). "After 10 years, few believe life on Mars". Associated Press (on usatoday.com). Retrieved December 6, 2009. ^ McKay, David S.; et al. (1996). "Search for Past Life on Mars: Possible Relic Biogenic Activity in Martian Meteorite ALH84001". Science. 273 (5277): 924–930. Bibcode:1996Sci...273..924M. doi:10.1126/science.273.5277.924. PMID 8688069. ^ The real Adolf Hitler and the real Bill Clinton in Contact (Video from Contact, and commentary) Critical Commons. Retrieved: 2013-07-21. ^ Remarks on the Possible Discovery of Life on Mars and an Exchange With Reporters William J. Clinton at The American Presidency Project, 1996-08-07. ^ The President's News Conference William J. Clinton at The American Presidency Project, 1994-10-07. ^ a b c Staff (July 15, 1997). "Cameo crisis on 'Contact'". Variety. Retrieved January 26, 2009. ^ a b c Staff (December 30, 1996). "Zoetrope sues over 'Contact'". Variety. Retrieved January 26, 2009. ^ a b Janet Shprintz (February 13, 2000). "Coppola loses 'Contact'". Variety. Retrieved January 28, 2009. ^ a b c Paul Karon (February 17, 1998). "Coppola's 'Contact' claim is dismissed". Variety. Retrieved January 28, 2009. Keay Davidson (1999). Carl Sagan: A Life. New York City: John Wiley & Sons. ISBN 0-471-25286-7.